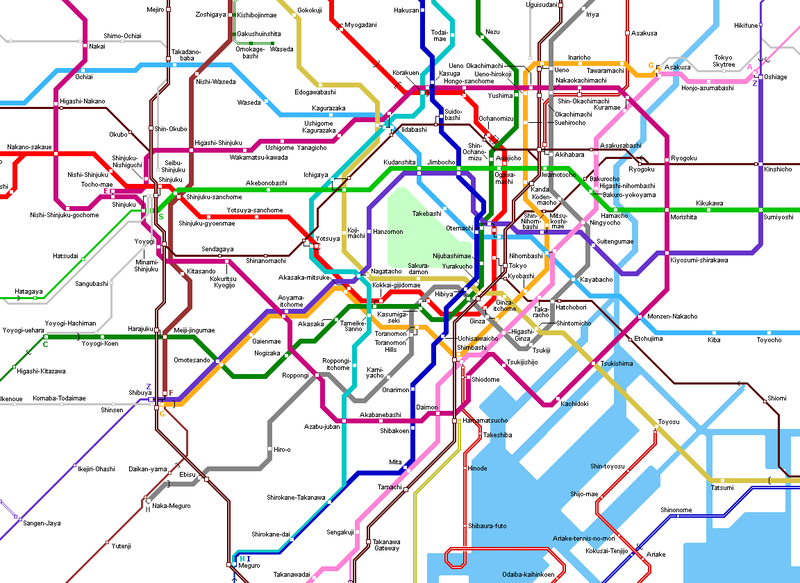 The Tokyo Subway system consists of 13 lines, which are operated by two different companies: Tokyo Metro Corporation (formerly TEITO; also called TRTA or Eidan Subway - Teito Rapid Transit Authority) and TOEI (Transportation Bureau of Tokyo Metropolitan Government). 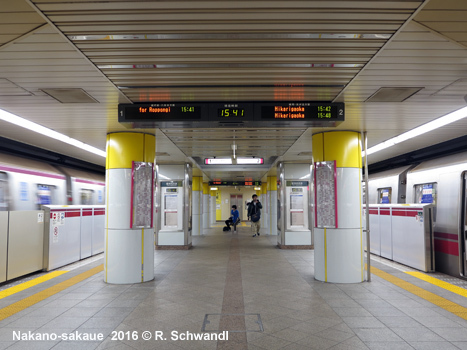 The first lines were built using international standard gauge (1435 mm) but later 1067 mm gauge was chosen, which is more common in Japan and thus allows reciprocal operation between subways and suburban railway lines, i.e. 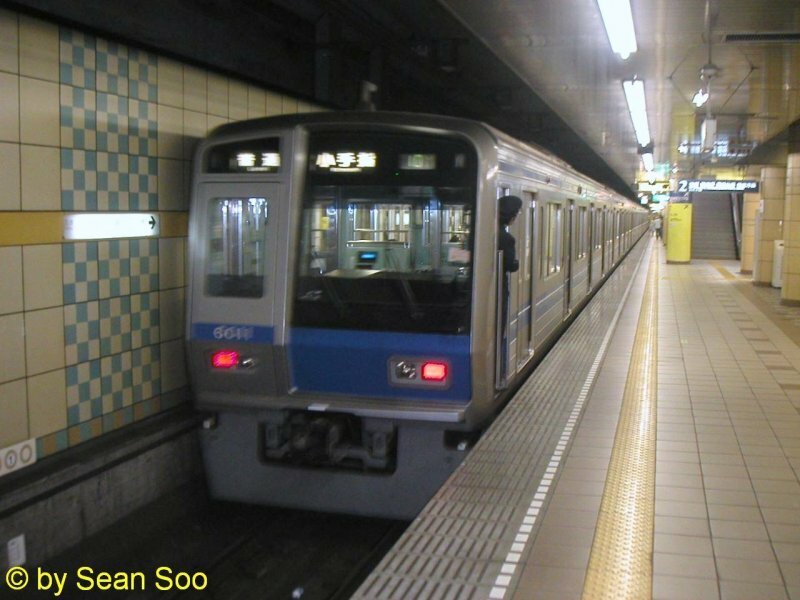 subway trains continue on suburban lines at certain hours or suburban lines use certain sections of the subway lines. 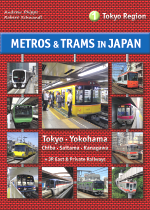 Several JR and private suburban rail lines radiate from different stations in Tokyo. 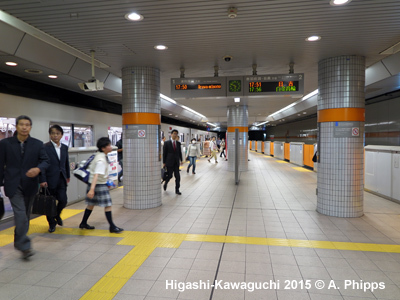 14.3 km, 18 stations, Asakusa - Shibuya (Line 3); 1435 mm gauge; no reciprocal service. 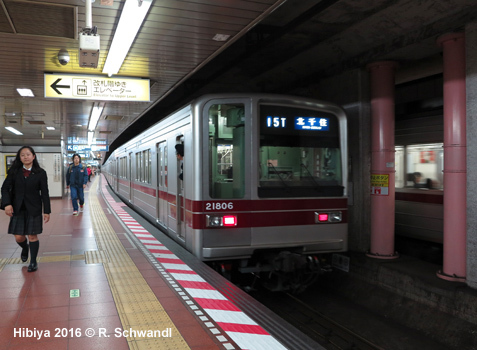 The first subway line in Tokyo, opened in 1927 as a private railway between Asakusa and Ueno (2.2 km), extended to Shibuya by 1939. 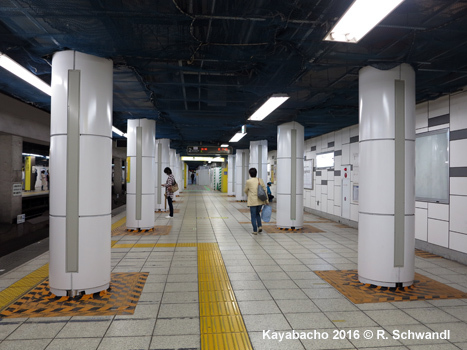 27.4 km, 27 stations, Ikebukuro - Ogikubo / Honancho (Line 4); 1435 mm gauge; no reciprocal service, four short surface sections. 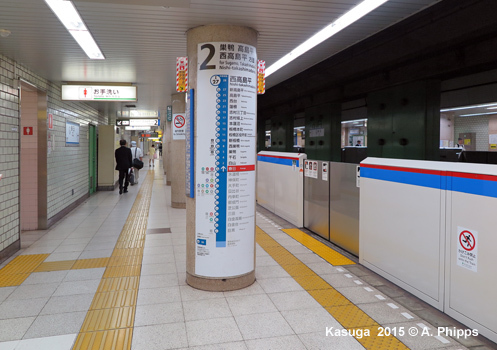 20.3 km, 21 stations, Kita-Senju - Naka-Meguro (Line 2); 1067 mm gauge; reciprocal service on northern suburban line (Tobu-Isezaki Line), while reciprocal service south on Tokyu Toyoko Line was discontinued on 15 March 2013. 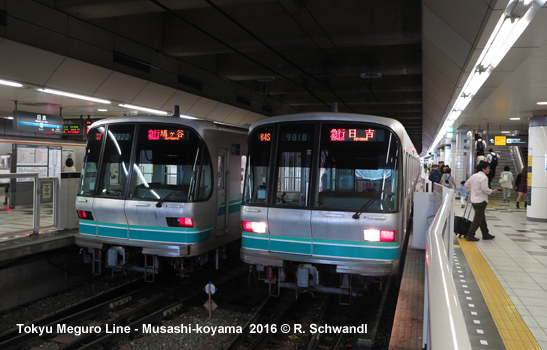 30.8 km, 22 stations, Nishi-Funabashi - Nakano (Line 5); 1067 mm gauge; at the western end, reciprocal service with JR Chuo Main Line; at the eastern end with JR Sobu Line and the Toyo Rapid Railway. 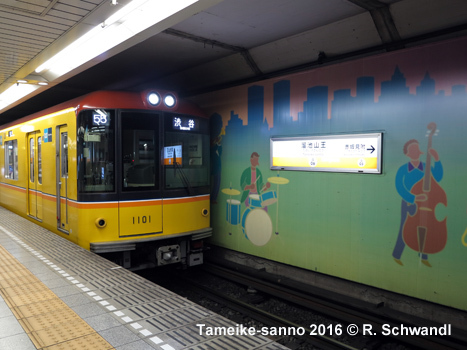 The Tozai Line (which means East-West Line) runs on the surface east of Minami-sunamachi (13.8 km). 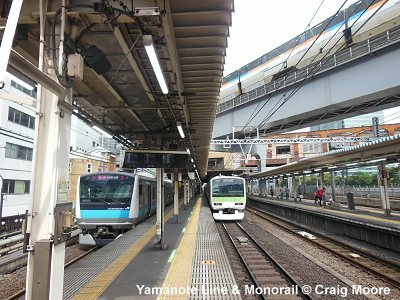 24.0 km, 20 stations, Yoyogiuehara - Kita-Ayase (Line 9); 1067 mm gauge; at the western end, reciprocal service with Odakyu Odawara Line; at the eastern end with JR Joban Line. 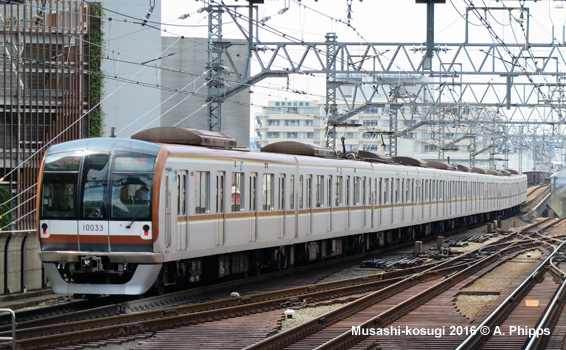 28.3 km, 24 stations, Wakoshi - Shin-Kiba (Line 8); 1067 mm gauge; from Wakoshi reciprocal service on Tobu Tojo Line; reciprocal service is also available from Kotake-mukaihara along the Seibu Ikebukuro Line. 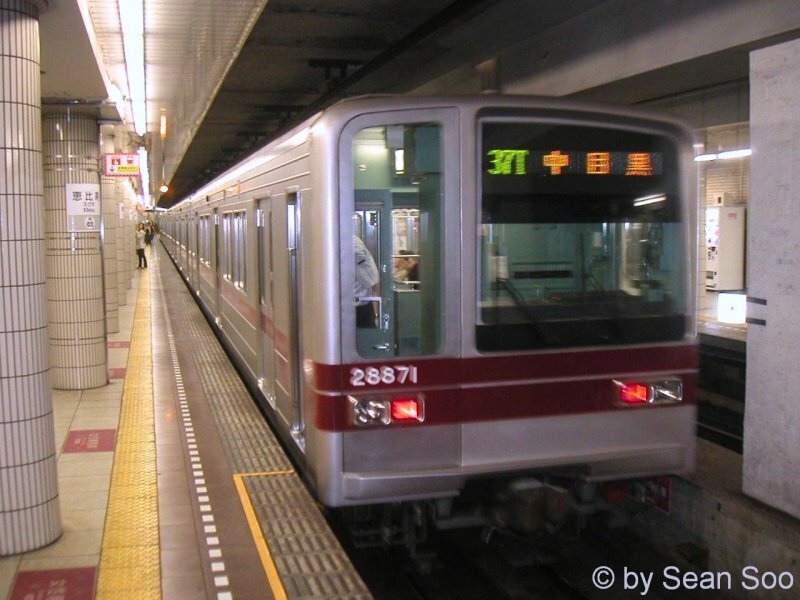 Opened 1974 - 1988; in Dec. 1994, the Kotakemukaihara - Ikebukuro section was quadrupled, with the Yurakucho New Line introduced to relieve the Yurakucho Line. 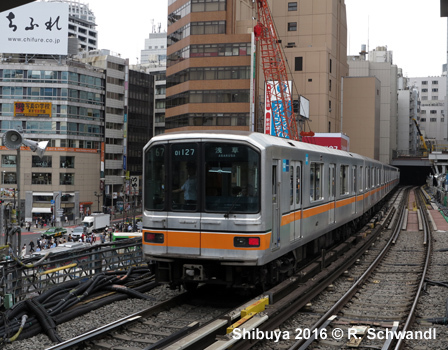 This line was extended south to Shibuya in 2008 and became the Fukutoshin Line. 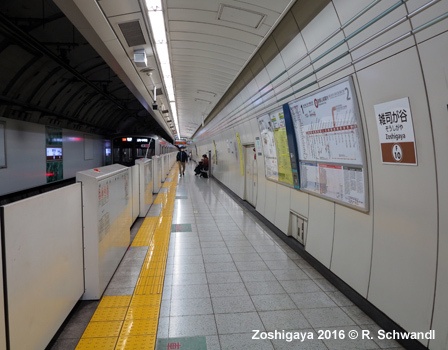 16.9 km, 14 stations, Shibuya - Oshiage (Line 11); 1067 mm gauge; reciprocal operation with the Tokyu Den-en-toshi Line from Shibuya and with the Tobu Isesaki Line from Oshiage. 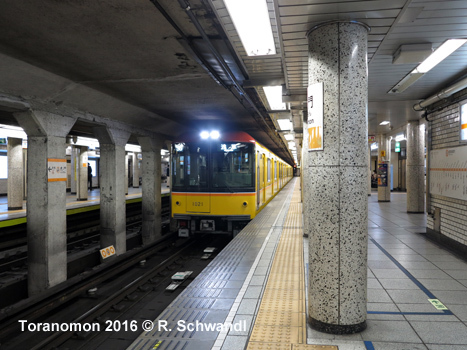 The Hanzomon Line runs parallel to Ginza line between Shibuya and Aoyama-I-chome, but on separate tracks. 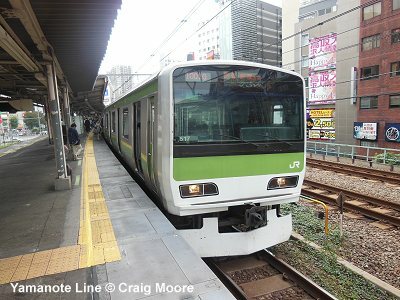 21.3 km, 19 stations, Meguro - Akabane-iwabuchi (Line 7); 1067 mm gauge. 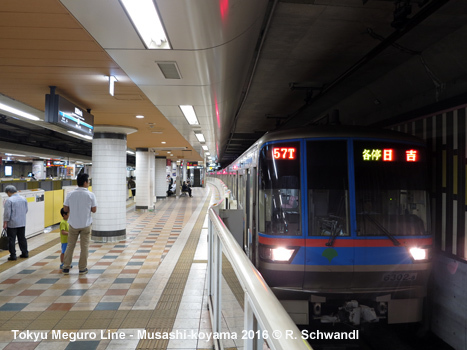 The Namboku Line shares tracks with the Mita Line between Shirokane-takanawa and Meguro, from where both lines provide reciprocal service with the Tokyu Meguro Line. 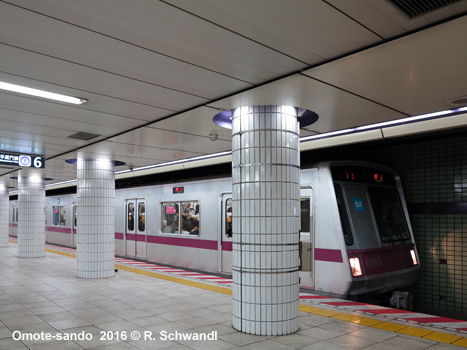 From the northern terminus at Akabane-iwabuchi most trains continue along the mostly underground Saitama Railway, which was opened on 28 March 2001. 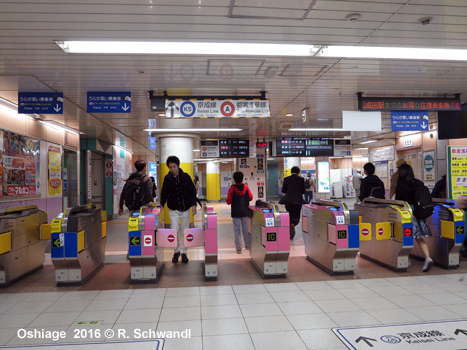 12.1 km, 11 stations (+ 5 stations share with Yurakucho Line), (Wakoshi -) Kotake-mukaihara - Shibuya (Line 7); 1067 mm gauge. 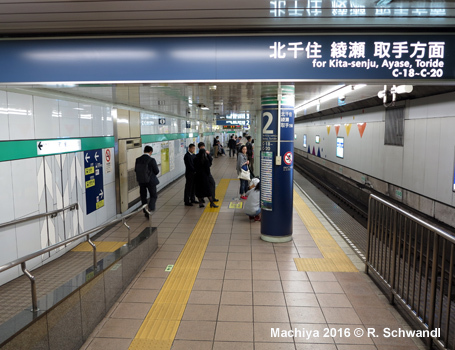 In Dec. 1994, a 3.2 km double-track section of the Yurakucho New Line (Kotake-mukaihara - Ikebukuro) (New Yurakucho New Line Ikebukuro Station) was opened to relieve the Yurakucho Line. 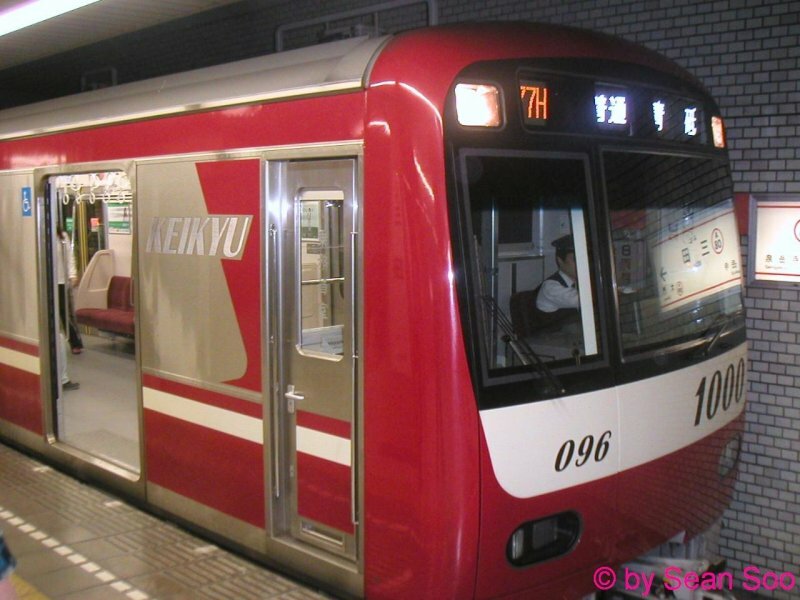 Initially referred to as Line 13, it was eventually extended south to Shibuya on 14 June 2008 as the Fukutoshin Line (fukutoshin means subcenter > the line links the three subcenters of Ikebukuro, Shinjuku and Shibuya). 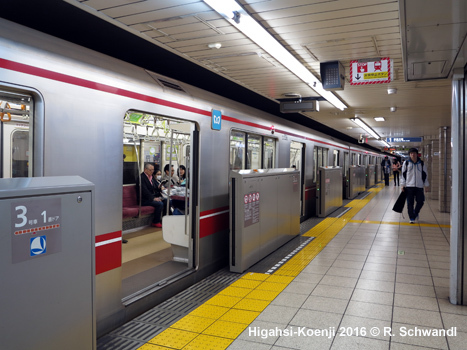 At the northern end, trains continue to Wakoshi on the Yurakucho Line, and beyond that point on the Tobu Tojo Line); reciprocal service is also available from Kotake-mukaihara on the Seibu Ikebukuro Line. 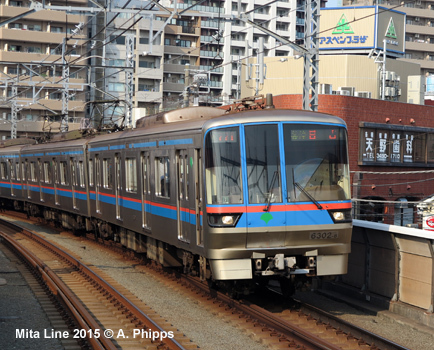 Reciprocal service from Shibuya south on Tokyu Toyoko Line to Yokohama began on 16 March 2013. 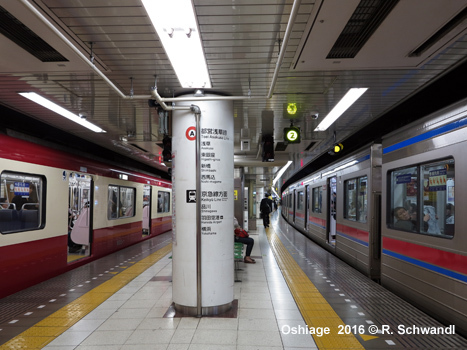 18.4 km, 20 stations, Oshiage - Nishi-Magome (Line 1); 1435 mm gauge; reciprocal operation on Keisei Oshiage Line, Keisei Main Line and Shibayama Railway Line from the northern terminus; and on Keikyu Main Line and Keikyu Kuko Line from Sengakuji. 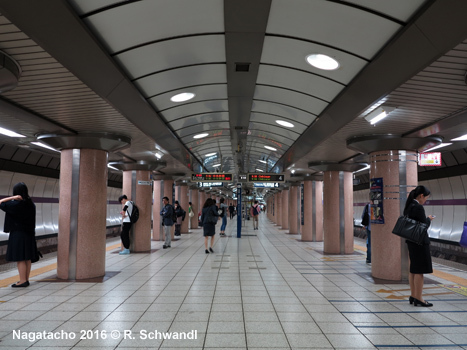 26.5 km, 24 stations, Meguro - Mita - Nishi-Takashimadaira; 1067 mm gauge; elevated north of Shimura-sakaue station. 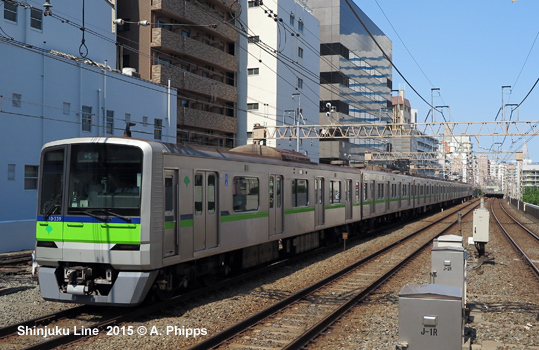 The section between Shirokane-Takanawa and Meguro is shared with the Namboku Line, 2.3 km, opened 26/9/2000. 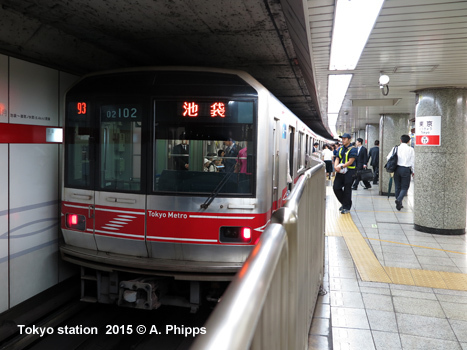 Reciprocal service from Meguro with the Tokyu Meguro Line. 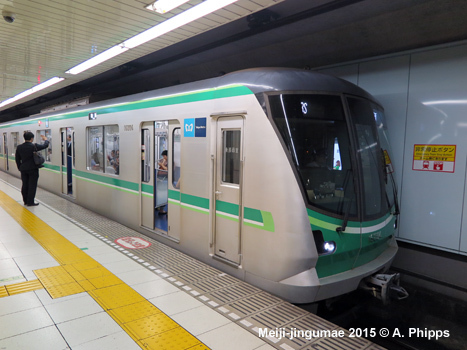 23.5km, 21 stations, Motoyawata - Shinjuku (Line 10); 1372 mm gauge; through trains from Shinjuku on Keio Line. 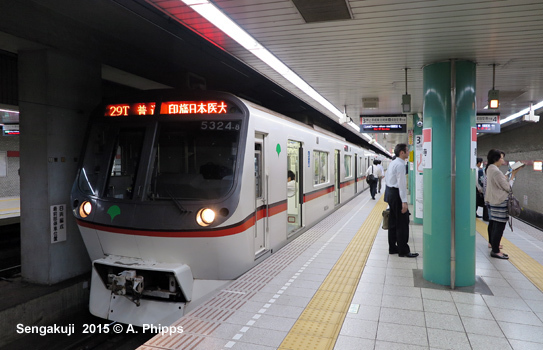 40.7 km, 36 stations, Hikarigaoka - Tochomae (Line 12); 1435 mm gauge; no reciprocal service. 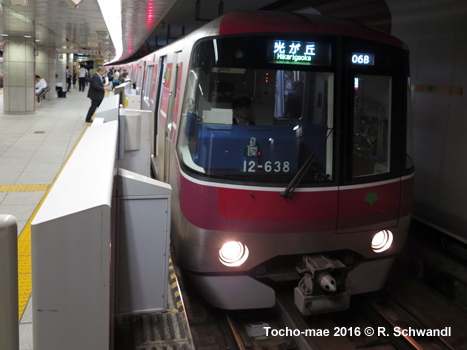 Opened in 5 stages between 1991 and 2002, the Oedo Line is like a ring line with a handle, but trains cannot run in a circle, but reverse at Tocho-mae. O-Edo-sen means Big Edo Line and Edo was the city's name until 1868. 12 Dec. 2000 - final section (25.4 km) of the entire ring line opened. 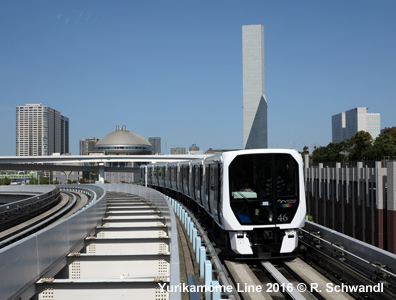 This is a fully automated driverless line which provides service to new waterfront developments on the reclaimed islands in Tokyo Bay. 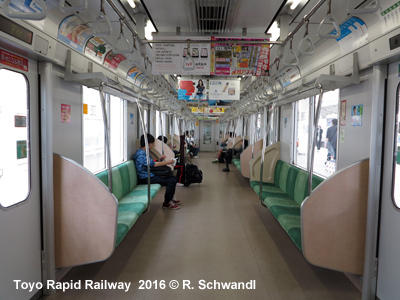 It has been opened on 1 Nov 1995 from Shimbashi (transfer to Ginza and Asakusa lines), goes along the coast for 3.1 km and then crosses the bay over the 570 m long Rainbow Bridge. 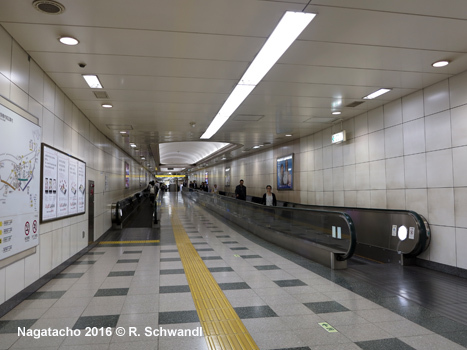 The total length of the first section was 12 km, there were 11 stations. 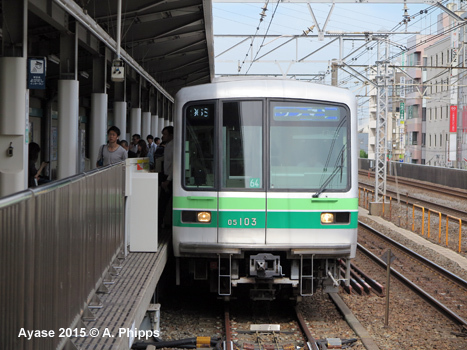 On the islands the line had two transfer points with Rinkai Line at Odaiba-kaihinkoen and Ariake. 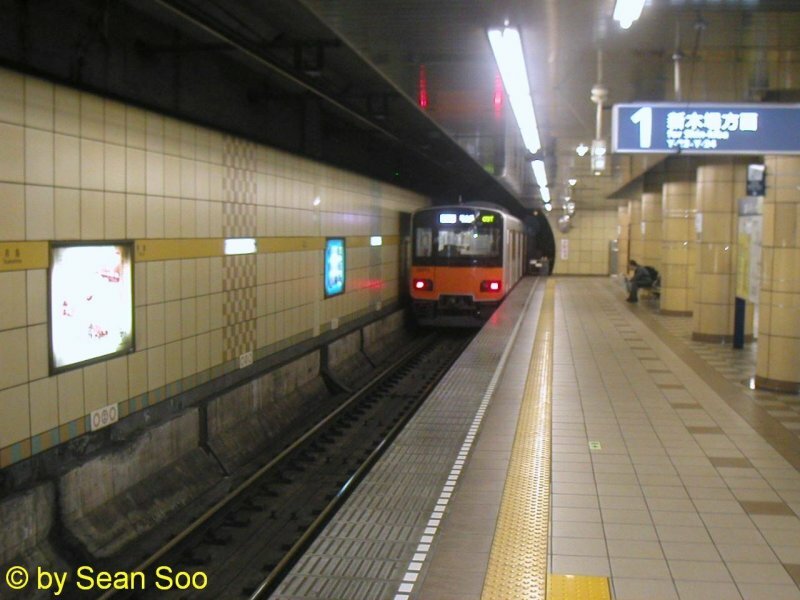 On 2 Nov 2002 a station Shiodome, a transfer to the newly opened station on the Oedo line was opened. 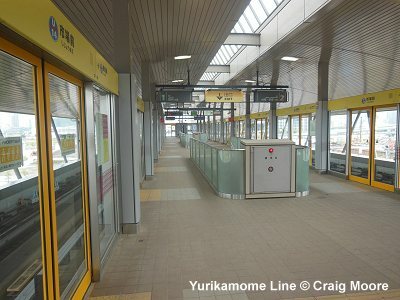 A 2.7-km, 4-station extension from the existing terminus Ariake to Toyosu station on the Yurakucho line opened on March 27, 2006. 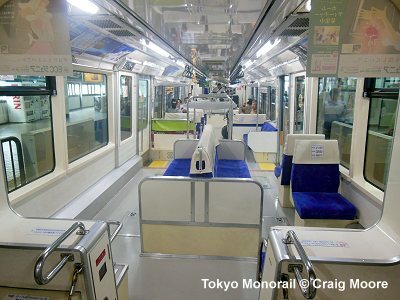 Fares are between 180 and 370 Yen depending on the distance travelled. 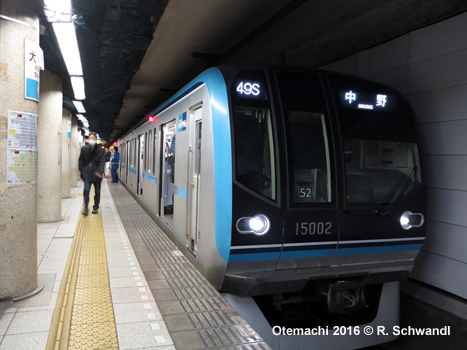 Officially knowns as TOKYO WATERFRONT AREA RAPID TRANSIT, this 15.1 km long metro line starts at Shin-kiba where it connects to the Yurakucho line and JR East. 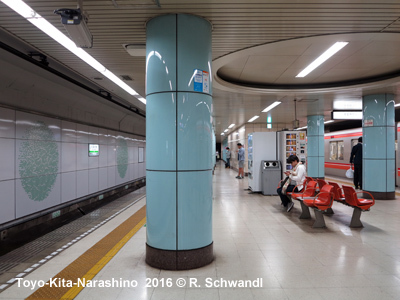 It runs mostly underground across Tokyo's harbour area. 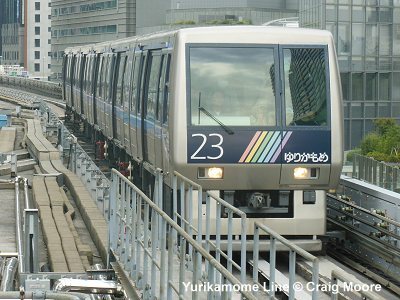 The initial 7.8 km was extended on 31 March 2001 from Tokyo Teleport to Tenzohzu Isle, where transfer is possible to the Tokyo Monorail. 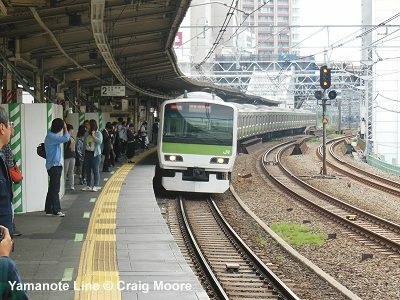 On 1 Dec. 2002 it, the western section to Osaki with interchange to the JR Yamanote Ring Line was brought into service. 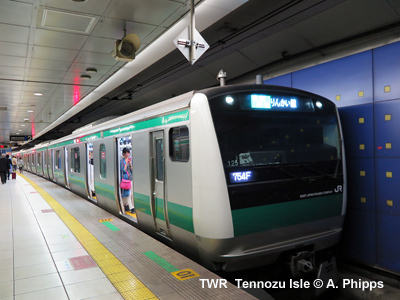 Station names are from east to west: Shin-kiba, Shinonome, Kokusai-Tenjijo, Tokyo-Teleport, Tennozu Isle, Shinagawa Seaside, Oimachi and Osaki. 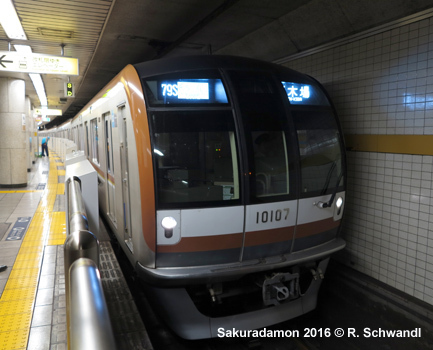 Fares are between 180 and 280 Yen depending on the distance travelled. 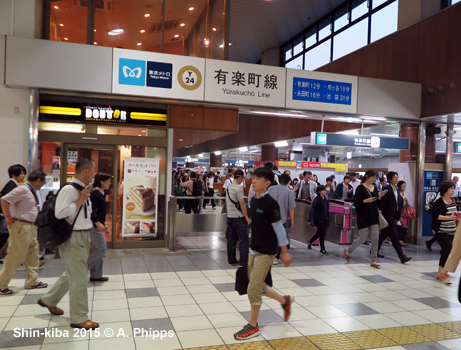 This line opened on 17 Sept 1964 for the opening of Olympic Games, and connects the Haneda Airport to Hamamatsucho Rail Station. 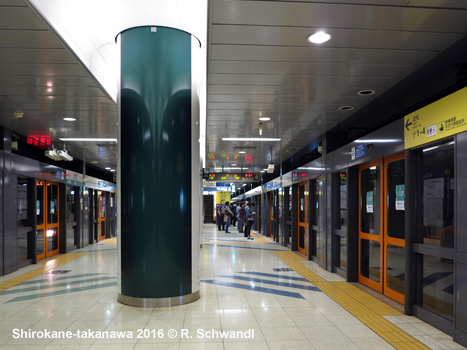 When it opened, it had only two stations - Hamamatsucho and Haneda-koku. 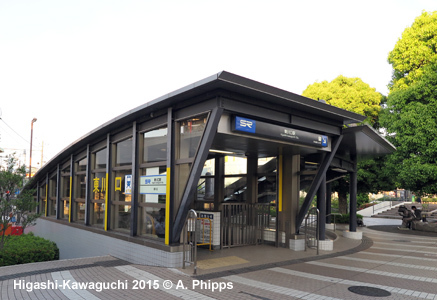 A year later, an intermediate station at Oi-keibajo-mae (Oi Race Track) was opened (27 May 1965). 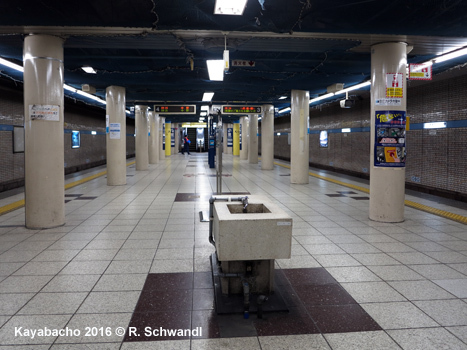 After that, several more intermediate stations have been added - Seibijo (20 March 1967), Ryutsu Center (15 Dec 1969), Showajima (7 Feb 1985) and Tennozu Isle (19 June 1992). 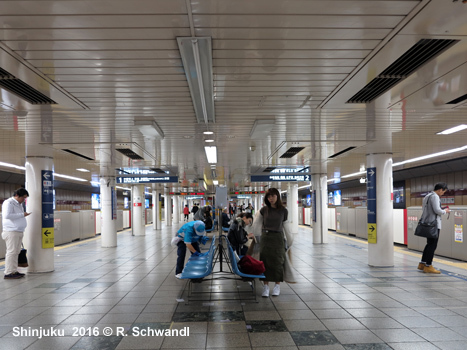 On 27 Sept 1993 the line was extended from Seibijo to Haneda-kuko-daiichi-biru (Haneda Airport Terminal 1) with two intermediate stations, while the former Haneda-kuko station was closed. 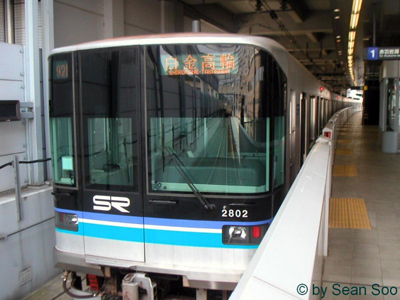 On 1 Dec 2004, a 0.9 km extension of the line opened to serve Haneda-kuko-daini-biru (Haneda Airport Terminal 2). 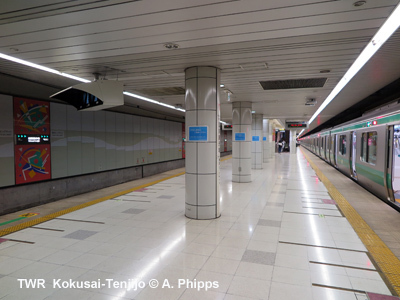 After a new station, Haneda Airport International Terminal opened on 21 Oct 2010 between Tenkubashi and Shin-Seibijo stations, the 17.8 km line has 11 stations. During day time trains go at 4-minute intervals, with only every third train calling at all stations. 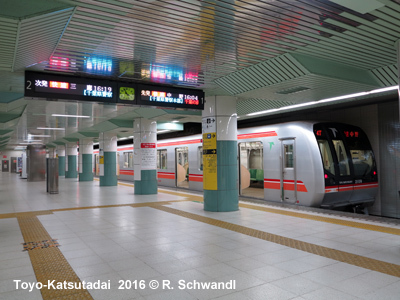 The rest of trains are skip stations between Ryutsu Center and Haneda-kuko-daiichi-biru or run express serving only the airport terminals. 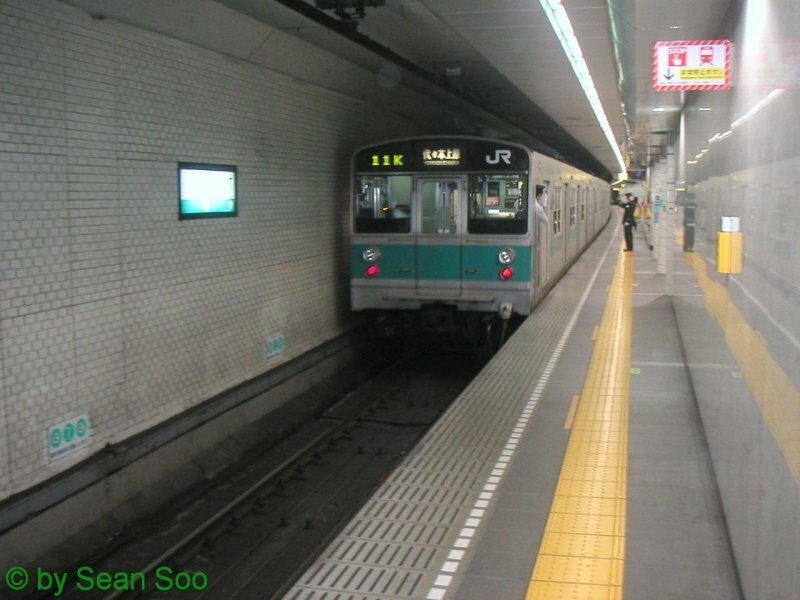 34.5 km circular line, partly elevated, with 29 stations, part of the JR network. 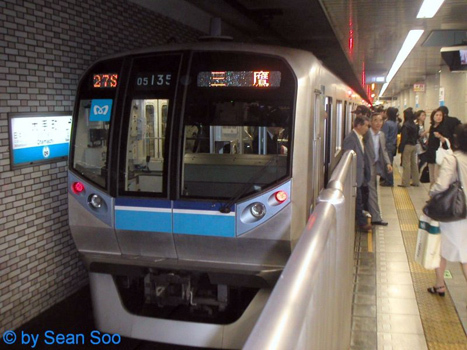 Connects with most private railways and several subway lines, with trains every 2.5 min during peak hours. First section opened in 1885 from Shinagawa to Akabane, later extended and electrified in 1909, ring completed in 1925. 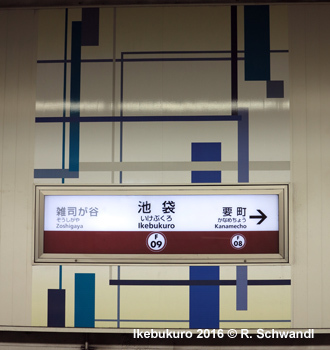 The Chuo-Sobu Line is a 60 km east-west local JR line that intersects with the Yamanote Line at Akihabara. 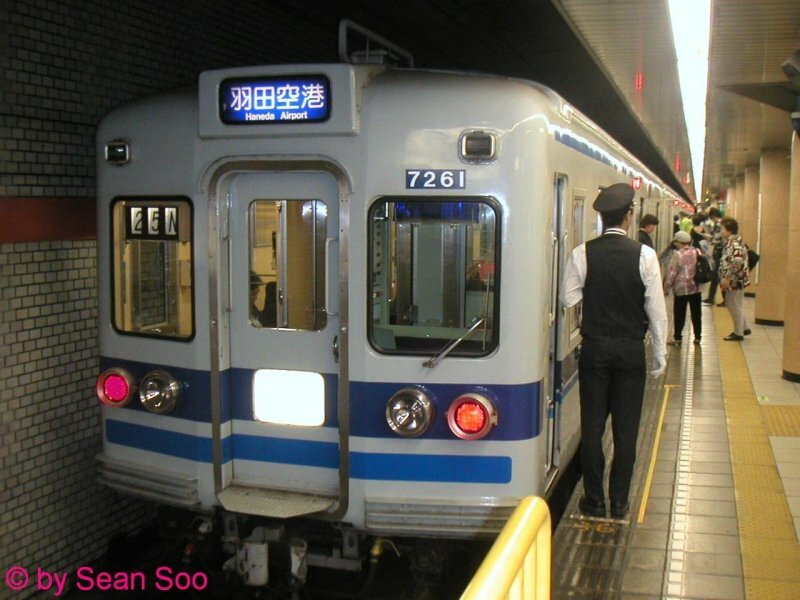 On the western leg, services are complemented by high-frequency Chuo Line trains which run express on the inner section, while on the eastern leg towards Chiba, the Sobu Line provides a parallel express service to/from Tokyo station (with trains continuing towards Yokohama as the Yokosuka Line). 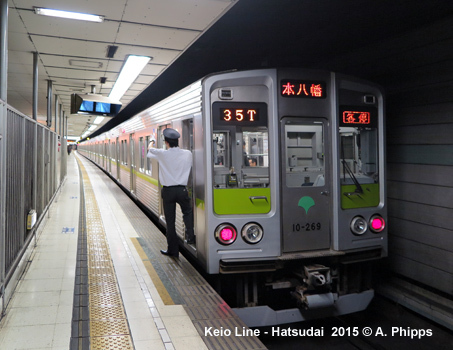 Besides these, also the Keihin-Tohoku Line (paralleling the eastern Yamanote Line) as well as the Keiyo Line, which runs from an underground terminus at Tokyo station along Tokyo Bay to Chiba, provide a frequent urban service, while the Musashino Line acts as a semicircular service through the northern suburbs. 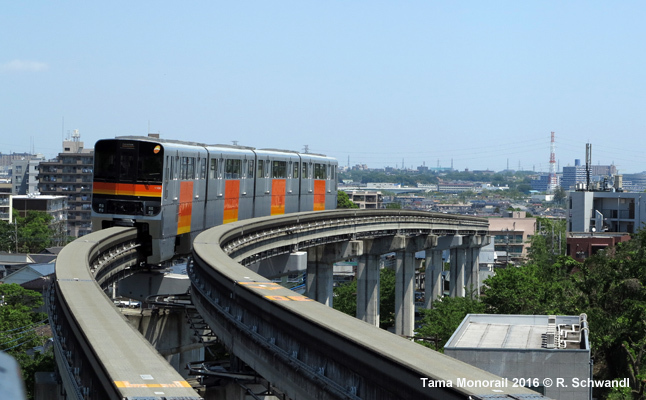 16 km monorail system running north-south through the western Tokyo suburbs, linking up with several suburban railways which provides connections to and from Central Tokyo. 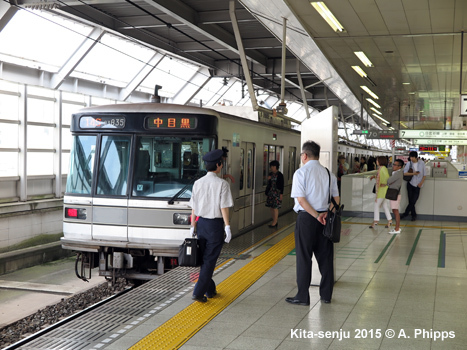 Opened 27 Nov 1998 Kamikitadai - Tachikawa-Kita, extended south to Tama-Center 10 Oct 2000. 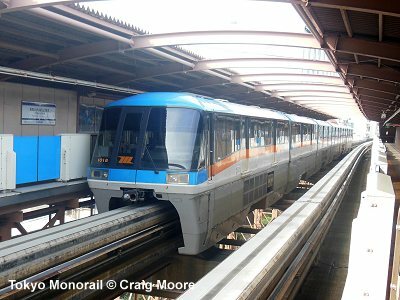 Visit our Tama Monorail page (including map and photo gallery! 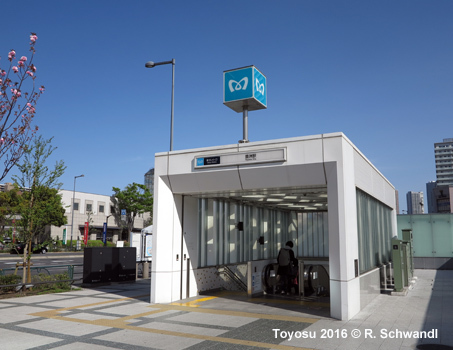 Opened on 30 March 2008, this is an automatic guided transit system (9.7 km, 13 stations), operated by TOEI and serving the northeastern sector of the Tokyo metropolitan area. 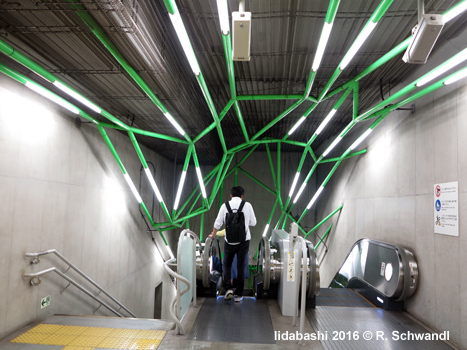 It intersects with the Chiyoda Line at Nishi-Nippori. 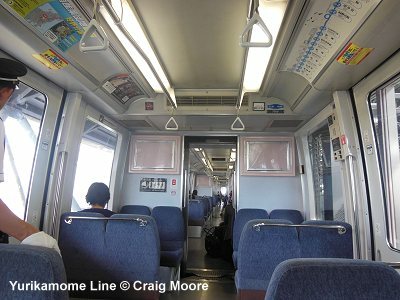 Opened on 24 Aug 2005, the Tsukuba Express is an independent 1067 mm urban/suburban rail line that links Akihabara in the Tokyo city centre with the science city Tsukuba in the northeast of the metropolitan area. 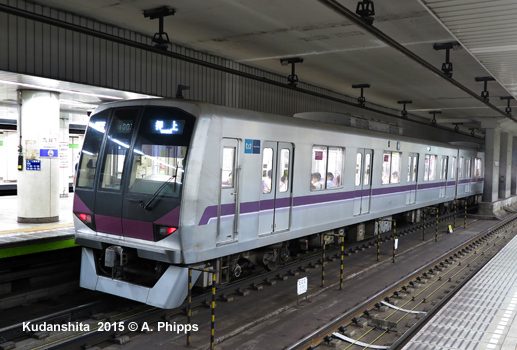 The line is 58.3 km, of which some 16 km is underground, with 20 stations. 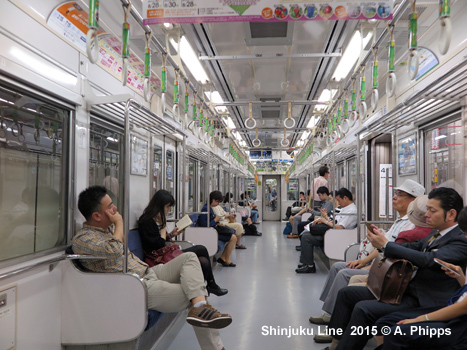 The New Shuttle, also known as Ina Line, is a manually driven guideway system, which runs alongside the Tohoku and Joetsu Shinkansen routes in Saitama Prefecture in the north of the Tokyo conurbation (12.7 km, 13 stations) - see map! 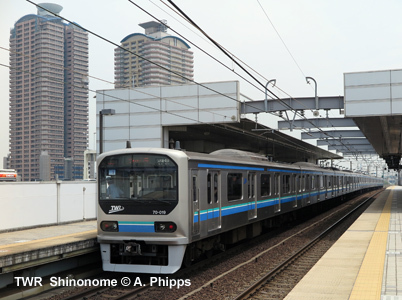 Akabane-Iwabuchi - Kawaguchi Motogo - Minami Hatogaya - Hatogaya - Araijuku - Totsuka Angyo - Higashi-Kawaguchi - Urawa Misono. T23/TR01 Nishi-Funabashi - TR02 Higashi-Kaijin - TR03 Hasama - TR04 Kita-Narashino - TR05 Funabashi-Nichidaimae - TR06 Yachiyo-Midorigaoka -TR07 Yachiyo-Chuo - TR08 Murakami - TR09 Toyo-Katsutadai. 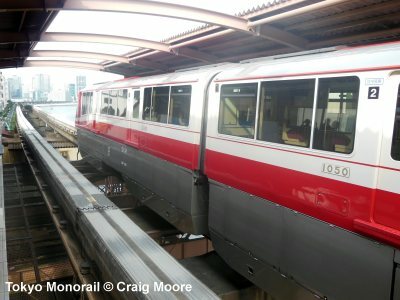 Visit our Chiba Monorail page! 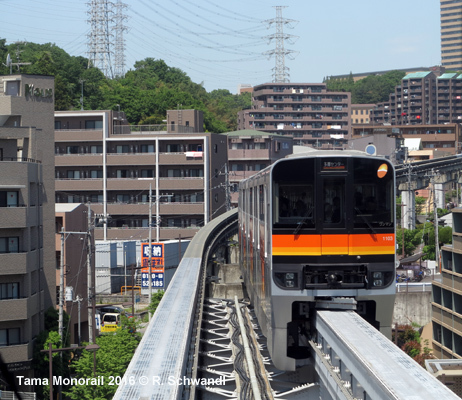 Visit our Shonan Monorail page!